A passion for history’s important stories led to the creation of an online repository that tells the stories of some of those interned families. Some of the stories will be about families from Washington, but they’re still making decisions about which ones. Nearly 13,000 people from our state were forcibly relocated. The group spent two years finding and researching objects and the stories behind them, then they created a website. Every week or so this year they’ll post another of the 50 stories until they’re all accessible. 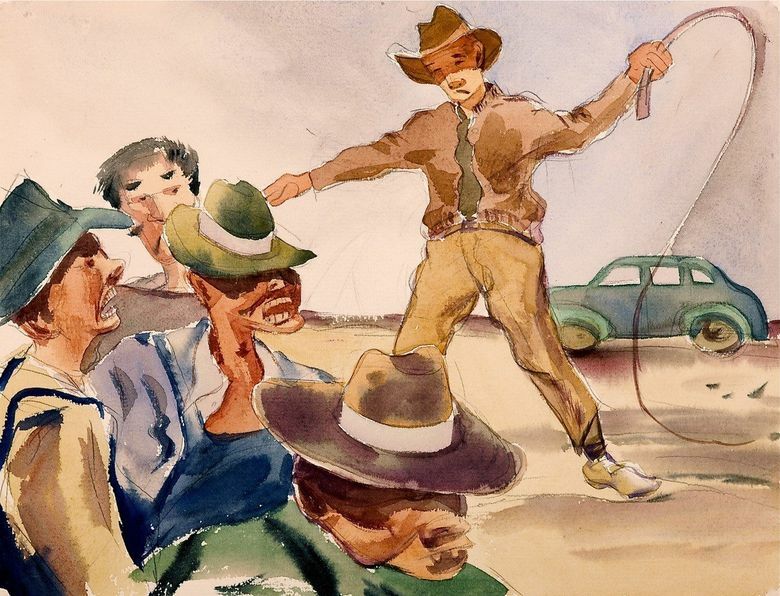 The first posting, Feb. 19, is the watercolor paintings of the late Gene Sogioka, which provide an unusually complex image of internment-camp life. 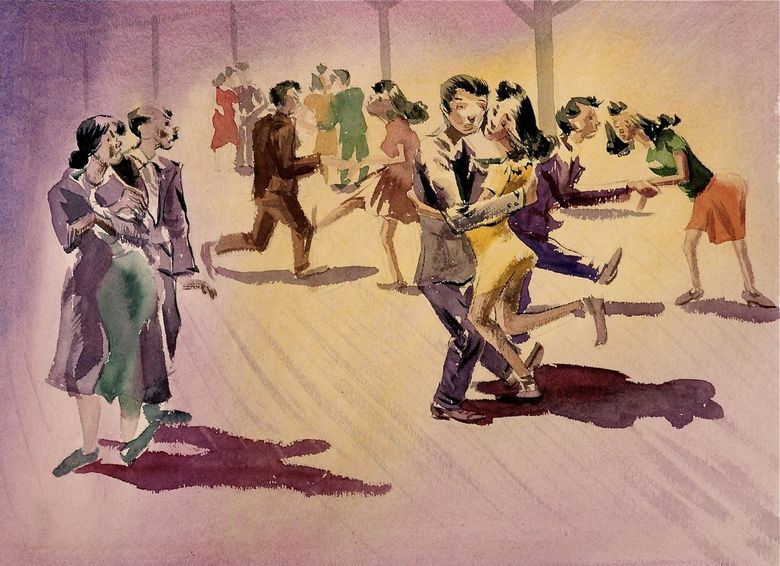 Sogioka, a Disney artist before the war, was hired by the federal government to document life in various camps. But the government wanted its own, more accurate record, which is what Sogioka produced. His own family had tried hiding out in the hills of central California to avoid incarceration, but eventually they turned themselves in and were taken to the huge Poston War Relocation Center in southwestern Arizona. His paintings are different from most of the other objects in that they speak for themselves. 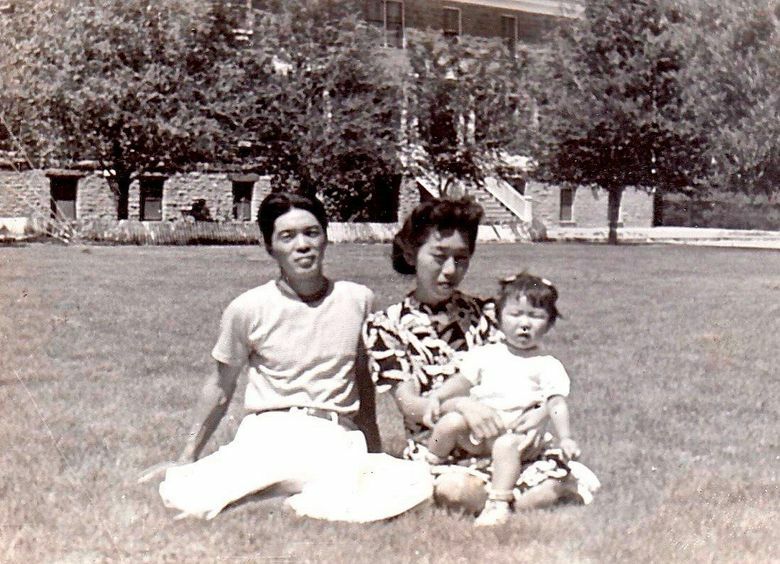 Sogioka’s work shows warm family moments, but also hot flashes of violent conflict, something not always part of the conversation about internment — the effect being confined and under pressure has on people. The government forced 120,000 people from West Coast communities into concentration camps, and two-thirds of them were U.S. citizens. The paintings show people dancing, doing dishes and other chores. There is also a painting of men beating FBI informants, a couple fighting, two boys spitting as an FBI agent walks past. They show the lack of privacy, dust storms, FBI agents taking a man away from his family. That history is relevant today, Russell said. We are again making policy based on fear and misunderstanding of immigrants. Russell has long been interested in bringing history into the present. She and my wife helped create and teach a class in Asian-American studies when they were college students in the 1970s, when Pan-Asian activism was taking off. Russell said items that speak to Japanese-American history are especially hard to come by because people were forced on short notice to leave their homes and most of their possessions behind. So the things they chose to carry with them have added meaning, as do the objects they created in the camps; many of those items were left behind when families were released. The campaign was successful and the collection is now in the Japanese American National Museum in Los Angeles. The idea for “50 Objects/50 Stories” came from that experience, and the belief that more people should know the history the objects represent. The power of telling the stories of regular people through objects has been gaining power in recent years. Russell was inspired by a book, “A History of the World through 100 Objects,” written by Neil MacGregor, former director of the British Museum, and by the Tenement Museum in New York City, which tells the stories of families through the ordinary objects they once owned. In Seattle, the Wing Luke Museum of the Asian Pacific American Experience has a digital-storytelling project, “Your Story, Our Story,” through a partnership with the Tenement Museum. And Seattle is home to the Densho project, a large, digital repository of history from the internment period. The 50-objects project doesn’t try to replicate that kind of breadth. Russell encourages everyone to find the history behind objects their relatives own before that history is lost. “People in any group, in any family can look around their homes, garages, attics, Russell said. “Take an object and ask your relatives about it.” You’ll strengthen your relationship with your family, she said, and you might be surprised by what you learn.